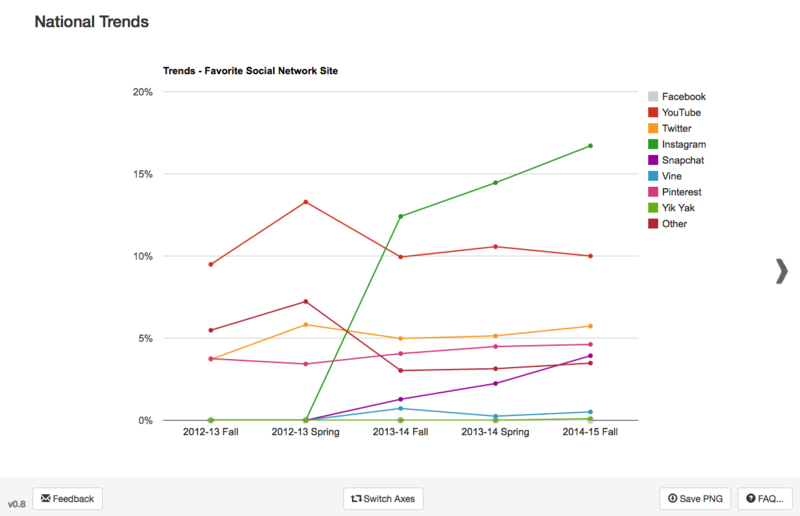 Visualize your students and nationwide media preferences with our new charting system. 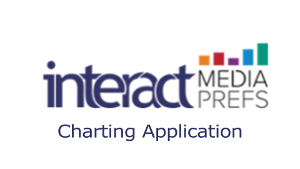 Welcome to Interact's MP Charts, a visual representation of Media Preferences data offering the ability to easily manipulate and interrogate both the national data and your community college's individual data. MP Charts is a fast, simple and fun to use program that allows you to see the Media Preferences data as you need and want to see it. This new system now works on PCs, Macs, tablets and smartphones. At the bottom left of all MP Charts windows, you will see a link for sending us your comments and feedback. We invite you to let us know if you find any bugs, issues, or things that do not work as expected. We also welcome any comments regarding what you like and what you feel should be improved or added. We will do our best to support your needs and wishes, as we continue the development of this system. These FAQs are designed to answer most of your questions and guide you through the system. We will continue to add more FAQ sections as we receive feedback (both directly, and via webinars and presentations). Intuitive navigation of the system is our top priority. We have performed (and continue to perform) extensive tests of the user experience, and we always welcome your comments on any changes that you feel make sense. The index page always starts with the top section selected on the left hand panel (i.e. 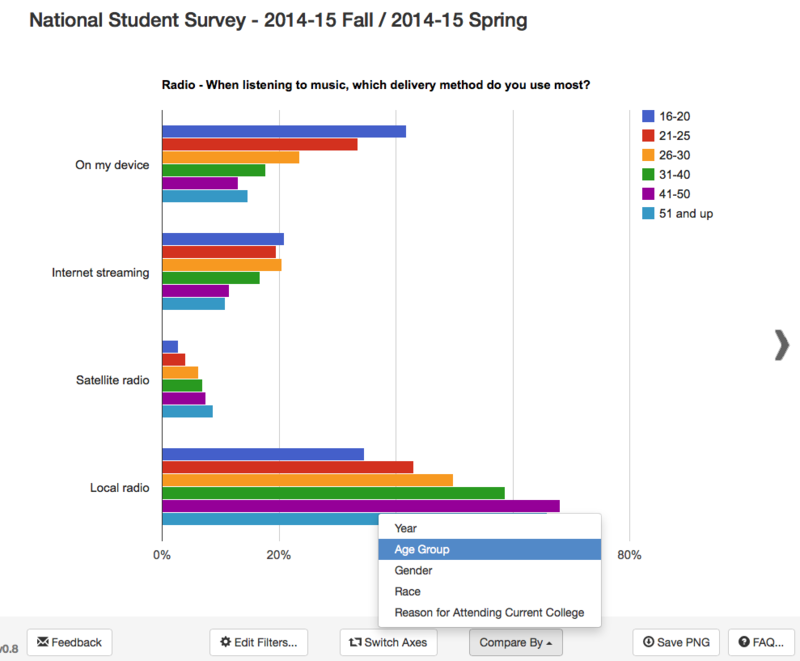 Radio), with a list of the questions asked in the survey, for that section only, appearing in the right-hand panel. You can explore the data sections by selecting different areas of interest on the left, and viewing all of the quantitative questions asked, in the right-hand panel. 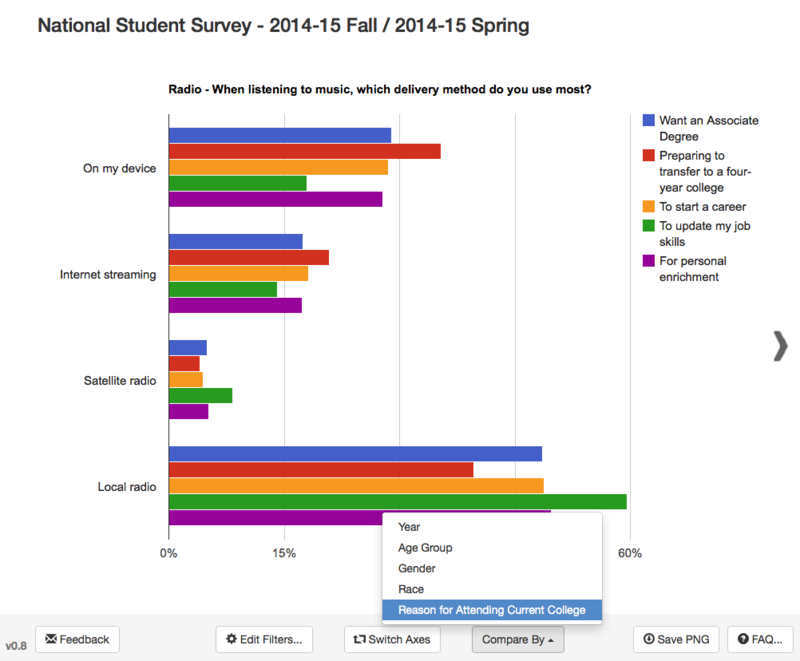 Selecting any question will display a graph of the survey data for that question. We have included right and left arrows on the displayed graphs that will take you to the prior or subsequent graphs within a section. If the arrow does not appear on the left, it means you are viewing the first graph in the section. If the arrow does not appear on the right, you are viewing the last graph in the section. At the top of each window, you will see some links. On the left, you will see the "Interact Media Prefs" Logo, which, when clicked, will take you back to the first 'home' screen after login (the screen which contains the selector for National, Local or Multi-Year National Trends). When you are viewing graphs within a section, you will also see 'Back to Questions' link, which takes you back to the Sections/Questions page. On the right-hand side of the window, you will see the name of your college, and a logout link to end the current session. Across the bottom of the window you will see links for sending us feedback, requesting a demonstration, reporting a bug, or requesting a feature (all on the left side). On the far right, you'll find links to 'Saving PNG' (which will save an image of the currently viewed graph to your computer's file download location.) and another to view the FAQ system. In the center you'll find three buttons: 'Edit Filters...' (visible on the Index and graph pages - see the 'Filter' section of the FAQ for more info), 'Switch Axes' (which will toggle the switching of the graph's Axes and group data.) and 'Compare By' (used to change the graph's existing compared data to available alternatives - see the 'Compare By/Cross-Tab' section of the FAQ for more info). Filtering is a feature which allows data mining to really come alive. We have designed a new interface to make filtering tasks easy and intuitive. Filtering is accessed through the 'Edit Filters...' button on the bottom of each page of a selected dataset. It has two primary functions at this time. The first is to select a subset of the data being examined (for example, to view ALL graph results, filtered to show only 16- to 25-year old respondents). The second function is to explore one graph and apply "what-ifs" to the data (for example, viewing favorite radio station genres of 16- to 25-year old males, and comparing them to the same age group among females). Alternatively, it could be used explore how different student demographics perceive the ways which they are contacted by the college. National Trends graphs CANNOT be filtered due to their unique multi-year format, so the 'Edit Filters...' button is not available. Accessing 'Edit Filters...' from the Index screen allows settings to be automatically assigned for your whole session, across any number of graphs or data types (i.e 'National' or 'Local' datasets). The system also allows you to make graph-specific 'what-if' changes to a page, without affecting any filters you may have set for the rest of your graphs. In order to keep the filtering both manageable and elegant, we have not exposed all possible filter combinations. Instead, we have used the ones that made most sense and then we organized them by type. For example, pressing the 'Edit Filters...' button will display a list of available filter types: 'Demographics,' 'Radio,' 'TV,' 'Print,' 'Communication,' 'Social,' and 'Other.' Clicking on any one of the list item's name will open up a list of specific items relating to the selection. (for example, selecting 'Demographics' will result in a list of 'Age Group,' 'Gender,' 'Race' and 'Reason for Attending College' cleavages, whereas selecting the word 'Radio' will list the questions containing the available filters used to collect the data. Clicking 'Radio' again will close the group. More than one group can be opened at one time, allowing you to see many of the available Filters on your screen together. Whole filter groups can be opened or closed together by clicking either the 'Open All' or 'Close All' links above each group's filters. Each filter is shown as a rectangle, featuring either a 'check-mark' in a blue rectangle (meaning it is currently selected), or a 'plus' sign in a gray rectangle (meaning it is un-selected). Clicking on any rectangle will toggle selection of that particular item. The number of total respondents that match your filter selection can be seen on the top right-hand side of the 'Edit Filter' window, in green text (for example: 'Max nVal: 17,000' means there is a maximum of 17,000 total respondents within your selected parameters. 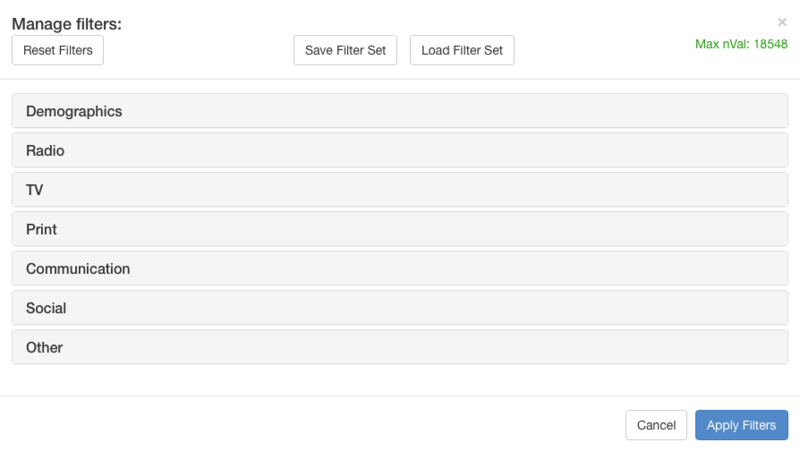 As you select more filter items, the maximum number of respondents will reduce in real time. Note that if the number falls below 400, the text color will change to red, indicating that the statistical average has fallen below the threshold of high probability. When filters are selected, and the 'Apply' button on the lower right of the filter window is clicked, any visible graphs will display the filtered changes. If filters are edited and applied from the 'Edit Filters...' button on the Index page, selections will automatically be saved and used throughout the whole session. To allow filters to be turned 'on' or 'off' for a whole group with one click, we also added 'All' and 'None' links at top of each group screen. This helps, for example, to simplify the turning 'on' only one filter from a long list of active filters. Please note that to support this All/None feature, we were forced to calculate the nVal of an all 'off' group to be the same as if they were all 'on', as filtering for people who ignored a question is an invalid parameter. If a whole group is left in the all 'off' state when the 'Edit Filters...' window is closed, or when 'Apply Filters' is pressed, the group will be reset back to all 'on' when the 'Edit Filters...' window is next reopened. When 'Edit Filters...' is selected from a 'graph' page, you will see (at the top right of the display) a panel asking whether you want to apply these settings for every graph in the session. If you do not press 'Apply' exiting the current graph will return settings to those last applied. At the top of the "Edit Filters..." window the left button, 'Reset Filters' will reset all the current filters back to their 'on' status, the second button is 'Save Filter Set' allows you to save, on your local computer, tablet or smartphone, the filter settings allowing them to be reloaded at anytime by clicking Load Filter Set, this requested feature allows filter settings to be saved between computing sessions. Please note that the set of filters is saved to your local PC or mobile device, so each device can have a different filter set saved. Every graph page using a filter has an 'Applied filters' summary box on the lower right of the window. This is an indicator of what filters, are being used on a page. For single selections, a list will appear in the box. For multiple selections, only a summary will be visible, and clicking within the box will display the whole list for review, altering, checking, and and resaving, if needed. The Applied filters summary box can be minimized to not 'block' part of a graph or legend, by clicking on the 'down arrow' at the top-center of the summary box, and can be restored again by clicking the the 'up arrow'. 'Compare By' functionality has been added in MP Charts Beta .8, this feature allows graphs to be customized to display any related data from the graph's dataset. The most used case for this function is to compare a result, or group of results, across multiple years. We have designed the interface to add this expanded functionality, without sacrificing ease of use. 'Compare By' allows you to display the data in different ways, depending on the information you wish to learn. To change the basis of comparison, simply click the 'Compare By' menu and choose the cleavage for comparison. If you would like to change the axis on which the data is visually displayed, simply click the 'Switch Axes' button. For example, by selecting 'Race' in the 'Compare By' menu, the question will instantly display the data as it relates to the race cleavage. If you instead wanted to see the how the data evolved from year to year, selecting 'Year' will break down responses to the question by year. (See examples below, click each image to zoom). 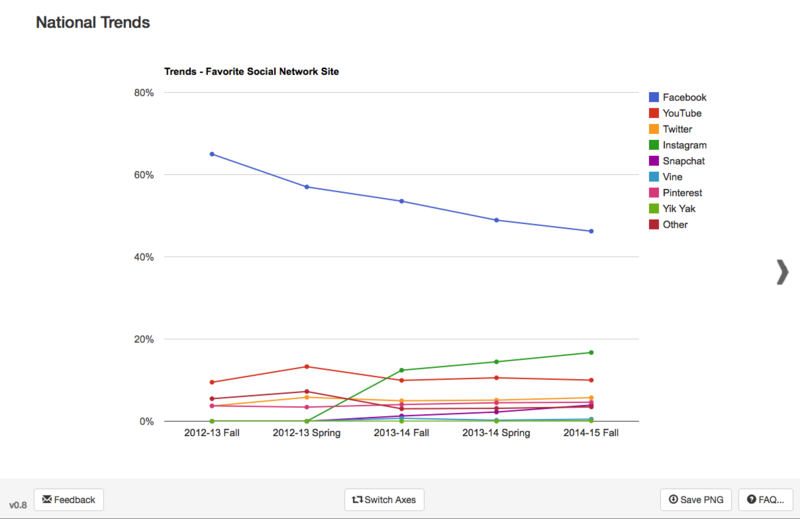 This allows you to tailor the graph to display the precise data needed. 1. Stacked bar charts do not support axes switching and the 'Switch Axes' button will not be visible. 2. Not all graph types support changing response groups. In such cases, the 'Compare By' menu will not be visible. 3. Compare settings differ for each graph, and are not able to be saved (however, it is still possible to save a PNG graphic). In the bottom right hand side of any MP Charts window containing a graph, you will see a 'Save PNG' button. This button will save a PNG image of the currently viewed graph to your computer's file download location. The physical size of the image will match the size of the window when you save, allowing you to save images in any size (with a corresponding file size) that you may desire for presentations or sharing. We have also named each saved PNG file with the text of the chart question, for easy organization and selection. The displayed graph can be tuned to your liking, before saving or printing, by re-sizing and/or removing items in which you have no interest. To remove an item that appears on the legend (to the right of each graph), just click on the colored box next to the item, and it will be instantly be removed from the graph. The graph axis will also be regenerated and optimized to fit with the subset of displayed data. The removal of legend items can also be used to zoom in on items that overlay each other, providing a more scaled look. For example, by removing Facebook (which has very high numbers proportional to the other selections) from the social media results, it is possible to see Instagram's (or any 'smaller' platform's) results more clearly. (See examples below, click each image to zoom). We are currently experimenting with the saving of scalable images, but not all computers are natively able to view them at this time. Printing to a PDF file however WILL save scalable images now. Printing a graph can be performed directly from the browser's print menu (as we have used HTML5 throughout this system). Just remember to set the printer preferences to print sideways on the page (as most graphs are rectangular). The output quality will be optimized for your selected paper width. Alternatively, you can simply save the images (as described above), and print them with your favorite image printing software. The quality of printed images will often be better when using the native browser's print function (the pre-saved images will be a fixed size - thus, scaling them can cause artifacting and blurriness. Copyright © 2007-2019 Interact Communications Inc. or its affiliates. All rights reserved.